How to get started, how to sell your work, how to promote yourself, and what to do once you are working. 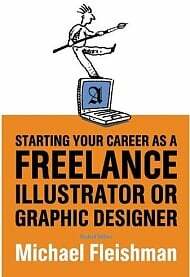 For those embarking on freelance careers in graphic design or illustration, this text seeks to provide the answers: how to get started, how to sell your work, how to promote yourself, and what to do once you are working. The volume is designed for beginning professionals, working professionals wishing to make a change, and entrepreneurs wanting to go out on their own. It details every business aspect of commercial art, including creating a portfolio, making initial contacts, developing a financial plan, acquiring supplies and equipment, pricing one’s work, and marketing on the Web. In a market-by-market survey, the author devotes entire chapters to explaining the nuances of selling one’s work to magazines, ad agencies, book publishers, greeting card companies, small businesses, and Web sites.